Share the post "Where to Find Rutgers 250 Plant Varieties"
Recently, there has been a lot of news about Rutgers plant varieties, especially the ‘Rutgers 250’TM tomato and ‘Rutgers Scarlet’TM strawberry. What you might not know is where to find them. Whether you are an experienced home gardener or are just starting out, it’s the time of year to start preparing garden beds and getting containers ready for planting. Specifically, it is recommended to start planting outdoors in New Jersey on or after May 15. Word to the wise: based on this year’s strange weather pattern, take extra precautions to protect your young plants from high winds and heavy rain. Upcoming plant sales will have lots of great varieties to choose from, all suitable for New Jersey’s growing zones. You will find a Rutgers New Jersey Agricultural Experiment Station (NJAES) information booth at these events with material about this year’s highlighted varieties. Rutgers Master Gardeners will also be in attendance to help you get started. Ag Field Day at Rutgers Day takes place on the last Saturday of April. This year, it lands on Saturday, April 30, 2016. This year’s annual Ag Field Day plant sale is on Saturday, April 30, 2016, as part of the Rutgers Day festivities. It takes place on George H. Cook Campus in New Brunswick, New Jersey. Middlesex County Cooperative Extension and Rutgers-trained Master Gardeners will be selling tomato and strawberry plants behind the Marine and Coastal Sciences Building. Come early and have your pick of the newly released Rutgers varieties! This year, Rutgers NJAES has an information table located adjacent to the plant sale. There will be flyers, brochures, and other giveaways involving the Rutgers 250 varieties and breeding programs, as well as Jersey tomato and Jersey strawberry t-shirts for sale. Part of the day also includes a “Meet the Breeder” Q&A, where attendees will have the opportunity to meet and ask questions of Rutgers dedicated plant and shellfish breeders. They are happy to answer questions about their research, including trials and varieties being released through the experiment station. Basil, Rob Pyne (graduate student): 10 a.m. – 11 a.m.
Cranberry, Jennifer Johnson-Cicalese: 10 a.m. – 12 p.m.
Tomato, Tom Orton: 11 a.m. – 12 p.m.
Turfgrass, Bill Meyer: 12 p.m. – 1 p.m.
Tree Fruit, Joe Goffreda: 1 p.m. – 2 p.m. Oyster, Ximing Guo: 2 p.m. – 3 p.m.
As for the strawberry breeding program, breeder Bill Hlubik will be assisting with the plant sale for most of the day, but is happy to answer any questions people bring to the table. He is representing Middlesex County Cooperative Extension and the Rutgers strawberry breeding program at Ag Field Day. Look for the plant sale closest to the NJAES information booth. Interested in learning more about our hazelnut or dogwood tree breeding program? Tom Molnar is your guy. He and his team are organizing the “RU Nutty” table again this year; they have been doing this since 2004! There will be lots of great information and also a special game. Come find the “RU Nutty” table at Ag Field Day, located near the Rutgers Floriculture Greenhouse (by the road between the greenhouse and Passion Puddle). Sneak preview: hazelnut trees will be given to game winners! The Rutgers Gardens Spring Flower Fair started 24 years ago. 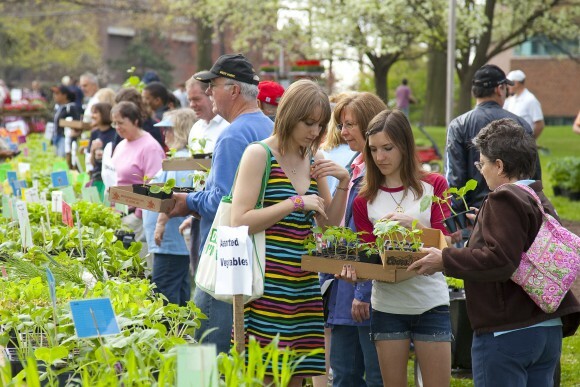 Since then, it has become New Jersey’s biggest non-profit plant sale. Rutgers tomato and strawberry plants, along with hundreds of other varieties, are for sale at the Rutgers Gardens Spring Flower Fair on May 6, 7, and 8, 2016. In addition to edible plants, they will also be selling ornamental shrubs and trees for home landscapes. May 6, Friday: 10 a.m. – 4 p.m.
May 7, Saturday: 10 a.m. – 4 p.m.
May 8, Sunday: 10 a.m. – 3 p.m. Managing Director of the Rutgers Gardens Bruce Crawford and other horticulture experts will be available for interview before and during the event. Over 250 varieties of trees and shrubs: 220+ perennial varieties, 160 vegetables, 90 herbs and culinary exotics, 100 tomato varieties (including ‘Rutgers 250,’ ‘Moreton,’ ‘KC 146,’ and ‘Ramapo’), ‘Scarlet Fire’™ dogwood, Rosy Teacups, and Venus varieties, 190 annuals, tropicals, succulents, and more! To get a better idea of what to expect, view the plant list at the bottom of the Spring Flower Fair webpage or Follow Rutgers Gardens on Facebook. Please note: shoppers are advised to bring a handcart or child’s wagon to help transport selections. 2016 marks Rutgers Gardens’ 100th anniversary. During this centennial year, there will be a number of special events, starting with the Spring Flower Fair. Mother’s Day Special – Sunday, May 8 between 12 pm and 2 pm. To celebrate our Centennial all the Moms at the sale are invited to pot up a ‘Super Sweet 100’ Tomato to take home. All purchases directly benefit the Rutgers Gardens Student Internship Program, which will provide hands-on educational experience for over 14 students this coming summer. Rutgers Gardens is entirely self-sustaining, therefore your support is greatly needed and appreciated! The featured varieties of the month for April and May are the ‘Rutgers 250’TM tomato and the ‘Rutgers Scarlet’TM strawberry. The newly released tomato is known for its attractive appearance, flavor, and ability to resist diseases and stresses typical of the East Coast. Home gardeners and commercial farmers will love this new tomato variety because it has been bred to produce high yields, starting early in the season. The most recently released strawberry is known for its deeply red color, sweet flavor, and resistance to diseases that typically threaten strawberry production in New Jersey. The exceptional fruit flavor will have you wishing every strawberry tasted this good! AG FIELD DAY: annual plant sale being held by Middlesex County Extension and Rutgers Master Gardeners, located behind the Marine and Coastal Sciences building at 71 Dudley Road, New Brunswick, NJ. Information on the history of Ag Field Day can be found at http://agfieldday.rutgers.edu. SPRING FLOWER FAIR: hosted by Rutgers Gardens at 112 Ryders Lane, New Brunswick, NJ. Call (732)932-8451 or visit their website, http://rutgersgardens.rutgers.edu. TOMATO: At the end of April, there will be a listing of all plant sales and retailers selling Rutgers tomato plants. The listing will be posted on http://njfarmfresh.rutgers.edu/JerseyTomato.html. STRAWBERRY: At the beginning of May, a strawberry availability map showing all the farms, farm markets, and nurseries selling Rutgers strawberries will be posted on http://breeding.rutgers.edu.